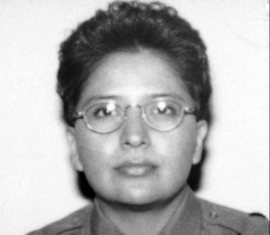 Officer Todecheene was killed in a single-car rollover crash near Halchita, a small community south of Mexican Hat. The 24-year-old victim and another officer in a separate vehicle were dispatched on a report of an alcohol party. When the other officer located the party, Officer Todecheene advised by radio that she was en route to his location. After she failed to arrive, officers searched the area and discovered the crash. Investigators determined that Officer Todecheene failed to negotiate a turn on a dirt road and suffered fatal head trauma after being ejected. Survived by her parents and siblings, she is buried in a family cemetery in Arizona. Her bronze memorial plaque is sponsored by the Saratoga Springs Police Department. We at the Utah Fallen are looking for contact information for Officer Todecheene’s family and relatives. If anyone can help us with this (it is kept confidential and only used to contact family when events related to Utah’s Fallen Officer events occur)it would be greatly appreciated.